The St Helens Detective Club (SHDC) was part of Culture Hub Artist in Residence 2014 programme. The club was formed to use Golden Age detective fiction to explore the community of St Helens. Whether it’s popular board game Cluedo or a page turning crime novel, everyone loves a good whodunnit? When it comes to books, crime stories and detective yarns are always among the most popular items requested by library users and bookshop customers. The club covered the period between the two world wars when many of the genre’s ideas, formats, rules and conventions were refined and when Agatha Christie reigned as the Queen of Crime. 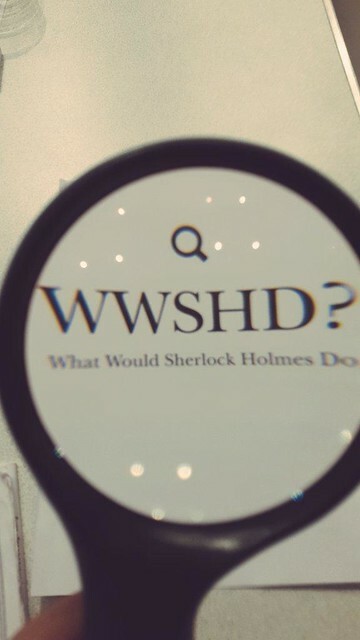 SHDC ran five workshop covering a brief history of detective fiction to trying out our own sleuthing skills – WWSHD (What Would Sherlock Holmes Do) – compared motives and methods of crimes solved by Hercule Poirot, and thought about what devious intentions simmered under the surface of the residents of St Helens. The club created fictional characters who they would believable brush past in the library, local cafe or on the street. These people were brought to life through mug shots, fake newspaper articles, and clues scatter though the library – including a body outline between the crime section. 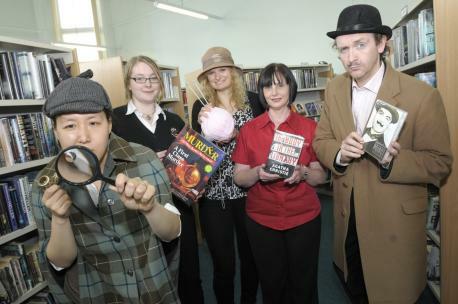 The activities culminated in a mystery for the public to solve – The Body in St Helens Library. A four act play, serialised in real-time culminated in a live radio in St Helens Library. Watch the trailer below. Participants were able to express their true thoughts about the community behind a fictional setting, had discussions about the social economic circumstances of St Helens, the legacy of the closed industries and how that’s affected the people who inhabit the town now. This project crossed paths with the other Re-Dockers projects during our joint St Helens 2014 residency – creating a stop-motion clue, slimy thoughts and the above trailer for the murder mystery.